How many times have you been finishing a deadlift only to lose it because your grip failed? Chances are it may have happened quite often. So, what do you do to correct this situation? If you're like some of the powerlifters that I know, you use straps. Straps, however, are not a remedy for a weak grip. In fact they will only make a bad situation worse. Instead of correcting the problem, straps circumvent it. 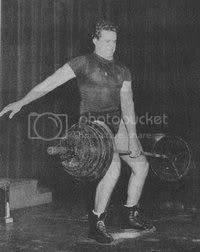 Remember, when you lift in competition you can't use straps, it's just your bare hands and the bar. Just how does one go about developing a strong grip? Actually, it's very simple. But don't let this simplicity fool you. Developing a strong grip requires intense mental concentration. You must have the ability to overcome pain and focus all of your energy on one specific objective. 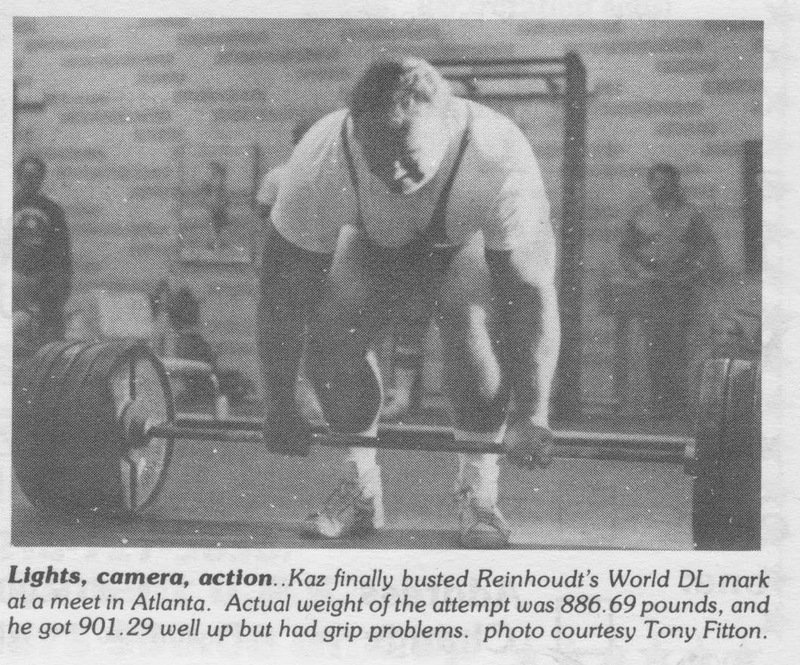 In fact, one of the main reasons why powerlifters lose their grip near the completion of a deadlift is that they slack off and lose their concentration. Possibly the best all-round exercise for grip development is the One Hand Deadlift. This exercise can be performed in either of two ways. You can use the position employed when performing the standard two hand deadlift in which you stand directly behind the bar, except that you use only one arm which is centered on the bar in order to balance the weight. The other method, which is preferred by most people, requires that you straddle the bar with both legs and once again you grasp the bar in the middle with the hand that you are going to perform the lift with. Don't start out with heavy weights. Begin with a relatively light weight and gradually increase the resistance until you are handling heavy weights. Not only can too heavy a weight at first overtax your grip, it can also place undue stress on your joints. Although the amount of weight that you use is important, even more important is the diameter of the bar. By INCREASING the diameter of the bar you insure that you develop your entire grip. Google Search of "home made fat bar"
You can slip successively larger pieces of pipe over your bar or you can tape sponge rubber to it. Gradually increase the diameter of the bar until it's 2.5 to 3 inches. When you return to your normal bar it will seem very easy to grasp it. Try to keep the repetitions in the range of 3-6. This will allow you to handle heavy weights, which is important in the development of a strong grip. 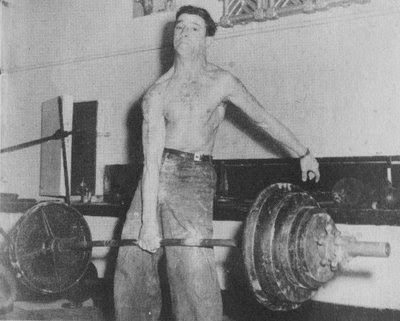 Another effective method of one-arm lifting is to perform lifts such as one-arm Snatches, Cleans and Bent Presses. Unfortunately, however, these lifts require a high degree of skill in order to perform them properly, and most powerlifters do not have the training time available to develop such skills. Your gripping strength can also be increased by grasping a heavy barbell or dumbbells (or any heavy object, for that matter) and attempting to hold it for as long as possible. This is a very intense form of training and requires the same focus we spoke of earlier. The pain can become so great that your wrists and forearms will feel like they're going to explode. But don't quit. Hold the bar for as long as possible. Hand grippers can be another effective means of developing grip strength. For best results do not use the gripper for repetitions. Perform one rep, attempting to keep the handles closed for as long as possible. Go for time, and/or increase the gripper difficulty. Holds of up to two or three minutes are not uncommon when training in this manner. Rope climbing, using just your hands, is another means of developing grip strength. Working a grip developing program into your routine is not difficult or complicated. Essentially there are two approaches you can take. The first would be a specialization program where you spend approximately 6-8 weeks concentrating on developing your gripping strength. During this time your main objective is to increase your gripping strength, while the three powerlifts are put on a maintenance schedule. The other approach is to perform your grip work as an assistance exercise. On your deadlift days, for example, you could add a few sets of one-handed deads and maybe some straight grip work with accessories. Personally, I prefer the first method. I believe that you can derive greater all-round grip strength and thus improve your deadlift by a greater degree. Not only will a strong grip help you with your deadlift, it will also help you with your other powerlifts, especially the bench press. A strong grip will help you to control the weight during the execution of the bench press. 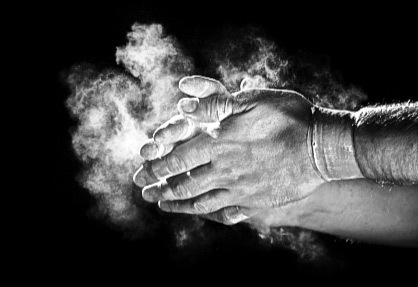 Thus it becomes very clear that a strong grip is an important factor in succeeding at attaining your powerlifting goals. Every powerlifter should devote some training time to developing his gripping strength. Hers too.